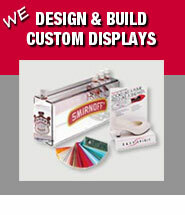 We fabricate Made-To-Order display solutions to meet your specific needs. Acrylic Stock Displays are durable, stylish and customizable. Custom sizes and styles are available. Take-One brochure holders promote your product or service. Promote your message with durable poster holders. The most rugged and versatile easels on the market today. Organize, store and display your brochures and literature for waiting customers. Portable and adjustable promotional banner stand displays. Tabletop displays to large format customized pop-up solutions. Displays are available in wall, counter or rotating styles. Quality POP merchandising display racks drive new sales. Develop leads, build a customer data base, or host a promotional contest. 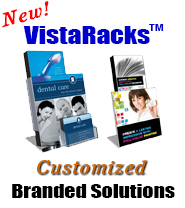 VistaRacks "A Better Way to Display!" Display World provides merchandising display racks, plastic brochure holders, literature stands, acrylic POP displays and more to companies everywhere. Whether you need to generate more product awareness or announce a promotion, our display solutions will help you sell more. We also offer acrylic sign frames, retail store fixtures, banner stands, poster floor stands and acrylic ballot boxes. We offer the lowest prices on stock displays and portable trade show exhibits, plus a unique collection of acrylic displays designed to increase your exposure on any budget. Plus, we have many new products and categories with thousands of in-stock displays. We are continually developing new display products designed to increase your exposure on any budget. If you're looking for the latest innovations in display design - We specialize in retail display fixtures, merchandisers for CD's, DVD's cassettes, books, literature, signage, & retail showcase fixtures. We have thousands of holders, and pockets in various sizes to choose from, and of course if you can't find it here we'll work with you to develop a custom display specifically made to your exact specifications. Check back often for special offers available exclusively through our online store! Display World - Bringing New Customers to Your Door Everyday!